Imagine being able to view microscopic aspects of a classical nova, a massive stellar explosion on the surface of a white dwarf star (about as big as Earth), in a laboratory rather than from afar via a telescope. 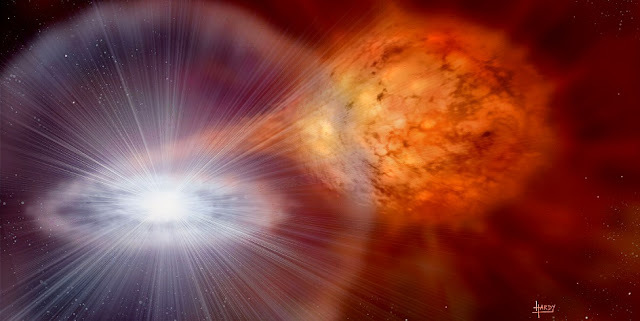 Cosmic detonations of this scale and larger created many of the atoms in our bodies, says Michigan State University’s Christopher Wrede, who presented at the American Association for the Advancement of Science meeting. A safe way to study these events in laboratories on Earth is to investigate the exotic nuclei or “rare isotopes” that influence them. Wrede’s presentation explained how rare isotopes are produced and studied at MSU’s NSCL, and how they shed light on the evolution of visible matter in the universe. In a recent experiment, Wrede’s team investigated stellar production of the radioactive isotope aluminum-26 present in the Milky Way. An injection of aluminum-26 into the nebula that formed the solar system could have influenced the amount of water on Earth. Using a rare isotope beam created at NSCL, the team determined the last unknown nuclear-reaction rate affecting the production of aluminum-26 in classical novae. They concluded that up to 30 percent could be produced in novae, and the rest must be produced in other sources like supernovae. Future research can now focus on counting the number of novae in the galaxy per year, modeling the hydrodynamics of novae and investigating the other sources in complete nuclear detail. To extend their reach to more extreme astrophysical events, nuclear scientists are continuing to improve their technology and techniques. Traditionally, stable ion beams have been used to measure nuclear reactions. For example, bombarding a piece of aluminum foil with a beam of protons can produce silicon atoms. However, exploding stars make radioactive isotopes of aluminum that would decay into other elements too quickly to make a foil target out of them. MSU is establishing FRIB as a new scientific user facility for the Office of Nuclear Physics in the U.S. Department of Energy Office of Science. Under construction on campus and operated by MSU, FRIB will enable scientists to make discoveries about the properties of rare isotopes in order to better understand the physics of nuclei, nuclear astrophysics, fundamental interactions, and applications for society, including in medicine, homeland security and industry. Project completion is expected in 2022, with the project team managing to early completion in fiscal year 2021.